1. 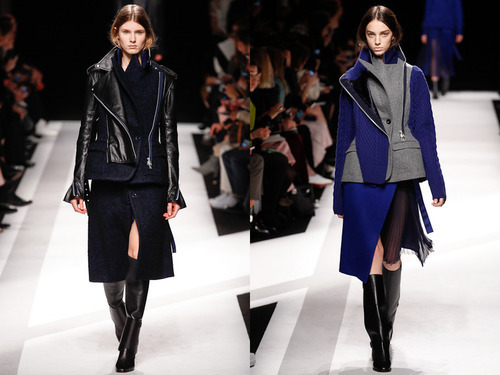 Chitose Abe’s runway for Sacai was downright impressive in its use of innovative mash-ups; a Mongolian lamb biker jacket merged with a Prince of Wales men’s coat, and sporty zip-jackets were worn with flowing silks. 2. Hedi Slimane’s charming FW14 collection for Saint Laurent finds its roots in all that glittered on Carnaby Street of the of ‘60s—Marianne Faithful, Jane Birkin and Edie Sedgwick but with a slick, modern makeover. 3. A$AP Rocky is working on a new instrumental mixtape called Beauty N the Beast: Slowed Down Sessions Chapter 1. Listen to the first two tracks, “Riot Rave” and “Unicorn”. 4. 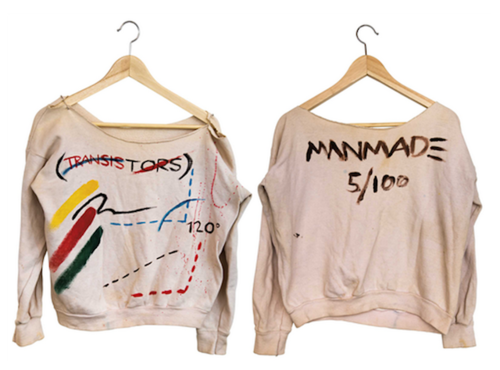 These sweatshirts were allegedly hand-painted by Jean-Michel Basquiat around 1979 and 1980. They’re listed in a Christie’s online auction for anyone who has $8k to spare. And for anyone who isn’t a skeptic. 5. Designer Jacqueline Nanne’s experimental project, Adaptive Survival Clothing, transforms the properties of wool to have a temperature-sensitive memory that adapts and adjusts to its surroundings. It’s designed for survival in the wilderness, but who doesn’t want a this textile for the unending Polar Vortex?